At the time of writing (06/09/14) the estimated global production of Ylang Ylang essential oil stands at 70-75 tonnes per year. Production is split largely into 4 geographical areas which are COMOROS (La Grande Comore, Anjuan and Moheli), AMBANJA (Northeast of Madagscar), NOSY BE (Island facing Ambanja) and MAYOTTE (Island part of the Comoros – under French administration). The plant part used to produce the oil is the flower, umbellate in appearance, consisting of 6 petals per flower. When the flower is in its infancy, it is green in colour, has no fragrance and the petals are largely coiled. Across a 14-20 day period the flower gradually develops into a highly fragrant flower and of a rich, vibrant yellow colour. Finally the flower displays a red spotty tinge at the base of the flower and this is an indication the flower contains the maximum amount of oil. At this stage the flowers are picked and placed in baskets across the early morning (before 10am) to ensure the best qualities and optimum yields. As soon as the harvesting and weighing is addressed it is critical that the distillation process gets underway as the flowers begin the process of fermentation/spoiling. Distillation times and equipment used to obtain the oil/fractions will vary from one distiller to the next. Therefore, you will find a lot of contradictory information; I wish to state the information I will now provide regarding the distillation process, is based on the distillers using state of the art apparatus to obtain the oil in its varying fractions. [General rule of thumb – many big naturals companies such as Robertet are investing heavily in Ylang Ylang – this means distilleries with state of the art stainless steel equipment and the heat sources to power the still will be oil fired or via liquid gas. The result is a better product aromatically and environmentally as the process is more controlled opposed to traditional methods of distillation which will involve a homemade still, logs set on fire to power the still, no control over temperature and material poured off into empty glass bottles. A lot of these traditional distilleries do exist around the Indian Ocean. Also grading Ylang Ylang is an art and skill in itself acquired over many years. Many of these older individuals who have this knowledge are not involved in today’s grading to the same extent. The younger generation and how they are trained, would seem to be more about yields and profits opposed to delivering something with soul and sparkle. Please note however this is just an observation. Now usually when we distil oil from a still the material will go into a condensing vessel and pour out into the drum/canister/container. In this instance, the condensing vessel has a tap and at the time of taking out the Ylang Ylang oil/fraction we turn the tap, collect the oil/fraction and close off the tap. The process is continuous and does not stop and start as some websites and reading material suggests – it would not make any sense. After about one hour to one hour and 30 minutes of firing up the still and letting the steam penetrate the flowers properly, the Ylang Ylang oil is poured out of the tap and collected for usually an hour period and at a density above 0.955. I want to add that at the very start of collecting the Ylang Ylang that the material emits an undesirable aroma. This material is poured off/collected and discarded. After this material we then collect what we will know as Ylang Ylang Extra. The chemical composition of Ylang Ylang Extra is characterised by a high concentration of p-cresol methylether (approx. 10%), methyl benzoate (approx. 6%), benzyl acetate (approx. 28%), linalool (approx. 9%) and 3-methyl-2-butenyl acetate (approx. 5%). Side Note: Ylang Ylang Extra Super – This is Ylang Ylang Extra material redistilled in a fractionating column. The idea is a client may exist who does not like a particular note in the Ylang Ylang Extra material. So this material is rectified. The fractions are collected and analysed. The fraction that is deemed as giving off the undesirable note(s) by the client is discarded and the fractions are all put back together again. About two hours – two hours and 30 minutes later and at a density between 0.945-0.955 we pour and collect the oil again. This material will be known as Ylang Ylang Grade One. 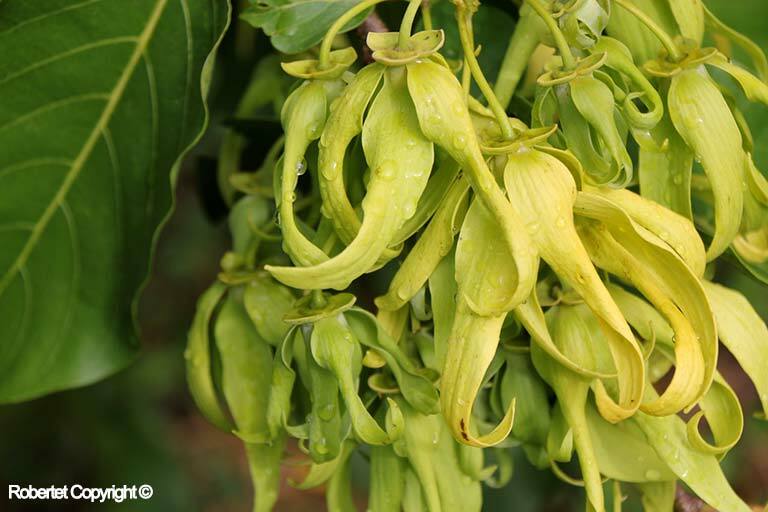 The chemical composition of Ylang Ylang Grade One is characterised by less of the volatiles found in Ylang Ylang Extra and an increased amount of geraniol, geranyl acetate, and b-caryophyllene. tes and transforms the odour into a thinner version of the extra grade, almost as if it had been watered down and sweetened with sugar, lacking the creaminess, roundness, voluptuousness and headiness of the extra. I would describe the body note as a watered down and more restrained version of Ylang Ylang Extra, floral, spicy with a slightly woody-green back note. The drydown is floral and spicy, faintly dry-powdery. Less tenacious than Ylang Ylang Extra. 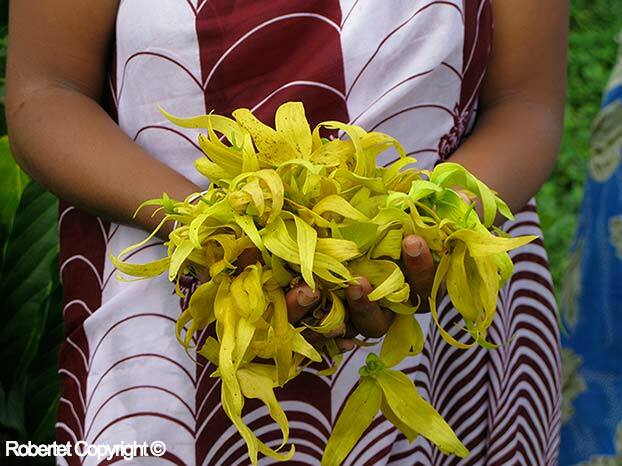 At the time of writing I understand it is common practice amongst the distillers on the Comoros Island to produce Ylang Ylang Extra fraction and third fraction. Fractions one and two are seldom produced on the Comoros. Then when the client requests Ylang Ylang Grade One/Two or Ylang Ylang complete – the distiller will blend the Ylang Ylang Extra with a proportion of Ylang Ylang Grade Three to create the desired material. After another three hours to three hours and 30 minutes have passed and at a density between 0.932-0.940 we pour and collect the oil again. This material will be known as Ylang Ylang Grade Two. After another six hours have passed and at a density between 0.905-0.910 we pour and collect the oil again. This material will be known as Ylang Ylang Grade Three. Marina Barcenilla has this to say about the scent of Ylang Ylang Grade Three ….“ Top notes are woody-sweet floral and heavy, with hints of rubber and an almost soapy smell; the chemical dry note is not as harsh or pronounced as I have found in other Grade Three oils. It is a fresh Ylang Ylang note, without any of the heaviness or headiness of the extra or the absolute, with a more piercing medicinal note, and a dry, woody and almost nutty back note. Not very diffusive. The woody green aspects of Ylang Ylang are well showcased in this oil, whilst never losing its delicate floralcy. As you think this oil has settled into a dry, woody floral ylang note, a surprise comes along…a spicy note is also hiding in there, and in this oil it reminds me more of eugenol and a spicy carnation note than of cinnamon. In theory Ylang Ylang Complete is an essential oil in the truest sense of the word – the result of steam distilling plant material. However, this is rarely the case as a genuine Ylang Ylang Complete would have those milky, sour, off notes you smell in Cananga essential oil which is a result of regular steam distillation. Instead, Ylang Ylang Complete as mentioned above is nearly always a creation of varying Ylang Ylang fractions and this is the case with the Ylang Ylang Complete Hermitage sells. 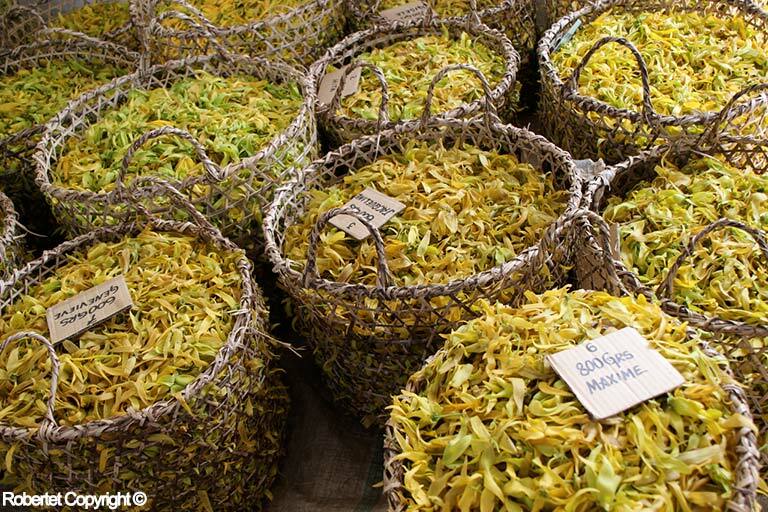 Marina Barcenilla has this to say about the scent of Ylang Ylang Complete…..”The top notes are true to ylang ylang, floral, heady, exotic, and with a touch of the medicinal, much more true to the extra or absolute than any of the other 3 fractions, but not as full-bodied and soft. The back rubbery note is quite pronounced, almost solvent-like, like sweet petrol but nice. The medicinal note fades quickly but the rubber note doesn’t; as it evaporates it becomes headier, sweeter, creamier and with more body and good diffusivity. Once the top notes evaporate this oil is an absolute dream…the harsh notes disappear and leave behind a creamy, exotic, luscious and beautiful ylang ylang note, with a lovely cinnamic spicy note and a promise of lilies, exotic flowers and tropical fruit. Every time I smell this again it is like burying my nose in a bunch of lilies! Very addictive and tenacious, lasting on a strip for several days. Ylang Ylang absolute is produced by solvent extracting the flowers and in my opinion is the truest representation of the flowers in their natural state. Dark green in colour and of a pourable viscosity. Ylang Ylang absolute is a full bodied and intense floral experience, very sweet, smooth, expansive, complex and rich. It’s like smelling the extra grade with the added bonus of additional depth, tenacity and diffusivity, going straight to the heart of the floral note without the lighter airy notes found in the distilled oils. Fruity, creamy, spicy and multi layered. © 2018 Hermitage Oils. Tutti i diritti riservati. Progettato da LCD / Costruito da Weborchard.